BSN ATRO-PHEX 98C On Sale! Dietary supplement. Energy & weight management breakthrough. » Mental and physical energy. » Muscle tightening and toning. » Removal of subcutaneous water. » manage unwanted body weight, increase energy, enhance mental focus, mood and well-being, and help tighten and tone muscle. » Weight Management, Performance Support. (These statements have not been evaluated by the Food and Drug Administration. This product is not intended to diagnose, treat, cure or prevent any disease.) Made in USA. Ingredients: Other Ingredients: Microcrystalline Cellulose, Magnesium Stearate, Gelatin. Atro-Phex - Extreme Multi-Action Rapid & Sustained Release Energy & Weight Management Technology (Proprietary Blend): Adipose Atrophy & Energy Stimulator Matrix (Patent Pending) Atro-Phex A scientifically engineered ratio of: B-Phenylethylamine, B-Phenylethylamine Malate, Hordenine HCL, Methylxanthine (a Source of Caffeine), 1-FAS50 (a Precise and Synergistic Ratio of High-Potency Fatty Acid Synthesis Inhibitors: Green Tea, Fleece Flower, and Loranthus Parasiticus), DL-Phenylalanine, Razberi-K (4-[4-Hydroxyphenyl] Butan-2-One), Naringin (99%), Citrus Aurantium (30%), Bioperine, Yohimbe HCL. Mood & Mental Performance Optimizers: N-Acetyl-I-Tyrosine-Ethyl-Ester Monohydrate, Vinburnine (99%), Vinpocetine (99%), Vincamine (99%). Aqua-Retic Matrix: Juniperus Communis Extract, Isopimpinellin (10%), Isoquercetin, D-Myo-lnositol-1, 4, 5-Triphosphate Hexasodium. Insulin Support & Weight Management: Cinnulin PF (Aqueous Cinnamon Extract). Pro-Thyroid Amplifier: 7-Keto (3-acetyl-7-oxo-dehydroepiandrosterone), Dicana (A Patent Pending Diiodothyroacetic Acid Isomer). Read entire label before consuming! 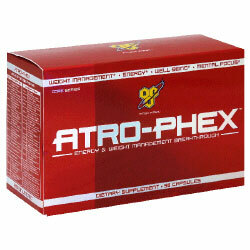 Atro-Phex is an extremely powerful dietary supplement strictly intended for use by healthy adults 18-50 years of age. Practice caution when using Atro-Phex in direct combination with any other caffeine - or stimulant - containing products. If you are sensitive to caffeine or stimulants, begin with 1 capsule until your tolerance has been fully assessed. Do not exceed 8 capsules within a 24 hour period. Do not take within 4 hours of bedtime. Do not use if you are prone to dehydration or in an environment with excessive heat. When using Atro-Phex consume a minimum of 120 ounces of water daily in conjunction with a healthy diet. Use only as directed. As a dietary supplement always begin by consuming 1 capsule of Atro-Phex on an empty stomach 30-45 minutes before your first meal or protein shake. Wait approximately 4-5 hours, and if suitable consume a second capsule (on an empty stomach 30-45 minutes before a meal or protein shake) and assess your tolerance again. If appropriate (which can be determined by assessing your tolerance level from the previous servings), repeat this procedure on the following day but increase each serving by 1 capsule. Continue to repeat this procedure each day until you have reached your individual tolerance level or you have reached the maximum of 4 capsules per serving, two times daily, whichever comes first. Do not exceed recommended use. Example of Atro-Phex Serving Protocols: The following recommendations are only intended for individuals who have fully assessed their tolerance levels and can manage one of the below mentioned serving protocols. Accelerated Results Serving: 2 capsules, twice daily - everyday. Extreme Results Serving: 4 capsules, twice daily - everyday.